Although few in number compared to many other Southern cities, a variety of monuments and memorials commemorating the Civil War exist in Jacksonville. These include graves, historic sites associated with camps and battles, monuments to those on both sides of the war, and schools and placenames dedicated to Civil War figures. J.E.B. Stuart Middle School: 1966, Westside Location In 1966, Duval County Public Schools elected to move Nathan B. Forrest High School to a new location on Firestone Road and convert the former structure into a middle school named after Confederate General J.E.B. Stuart. Joseph Finegan Elementary School: 1968, Mayport Location The last of Duval County’s schools named for a Confederate figure commemorates General Joseph Finegan, a Confederate general operating primarily in Northeast Florida, and the namesake of Camp Finegan. Unlike all of Jacksonville’s schools named for Civil War figures besides Kirby-Smith, its namesake was a local figure. It opened late in Jacksonville’s struggle with school desegregation, which finally ended in 1971. Museum of Southern History: 1975, Fairfax Location Members of the Kirby-Smith Camp of the Sons of Confederate Veterans founded this private museum in 1975. Its collection was originally kept in private homes, and opened to the public in 1982; a full-fledged museum was established on Herschel Street in 1993. The museum generally promotes a romantic image of the Confederacy and the “Old South”, downplaying slavery’s role in the Civil War, although it is home to many one-of-a-kind artifacts and an impressive library. 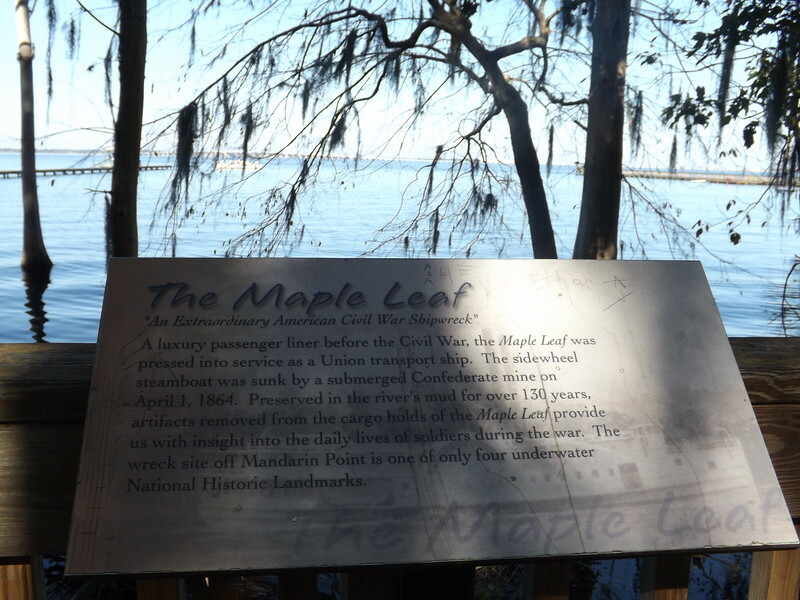 Location In 1864, during the fourth Union occupation of Jacksonville, the U.S. Army troop transport ship Maple Leaf struck a Confederate torpedo mine in the St. Johns River near Mandarin. Four soldiers died, and the ship quickly sank. After the war, no interested salvagers could be found, so in 1882 the Army Corps of Engineers dragged the wreck to a safer location in the river. It remained there for over a century before a team of local divers rediscovered it in 1984, buried under 7 feet of silt in 20 feet of black water. The mud had left the wreck and its contents remarkably well preserved, and afterward over 3000 artifacts were recovered, making it one of the most valuable archaeological sites associated with the Civil War. The wreck is inaccessible, but the artifacts are in display in the Museum of Science and History, the Mandarin Museum, and institutions across the country. A historical marker describing the Maple Leaf’s sinking and discovery stands in Downtown Jacksonville. Location Camp Milton represents Civil War history done right. 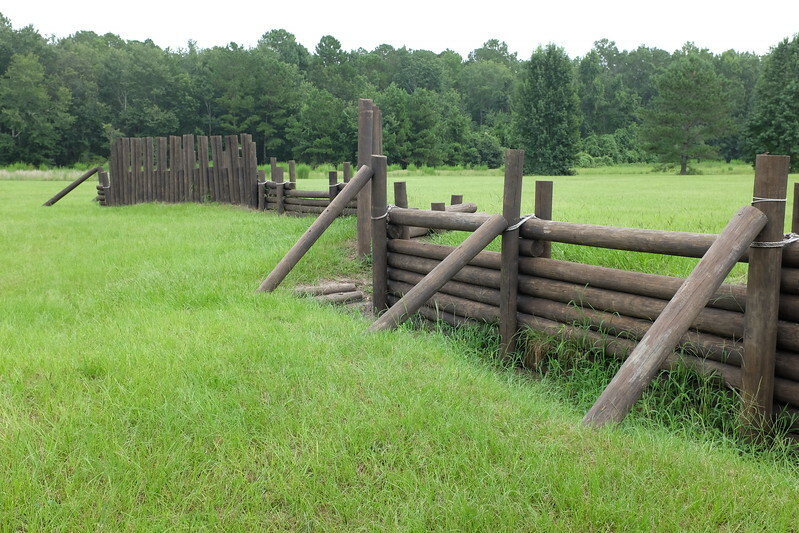 The preserve encompasses the site of Camp Milton, a major Confederate fortification constructed in February 1864. One of Florida’s most important Civil War sites, it was a major staging ground for over 8000 Confederate troops before it was captured by Union forces from Jacksonville later that year. The site was lost for over a century before being rediscovered in 1973; the state subsequently purchased part of the property in 1981. In 2001, the City of Jacksonville took over the site and purchased additional parcels through the Preservation Project for the creation of a park. The preserve includes the old Confederate earthworks - some of the few remaining in the state - as well as trails, a preserved Florida cracker farmstead, a historical center, and a reconstructed picket line and reenactment ground. 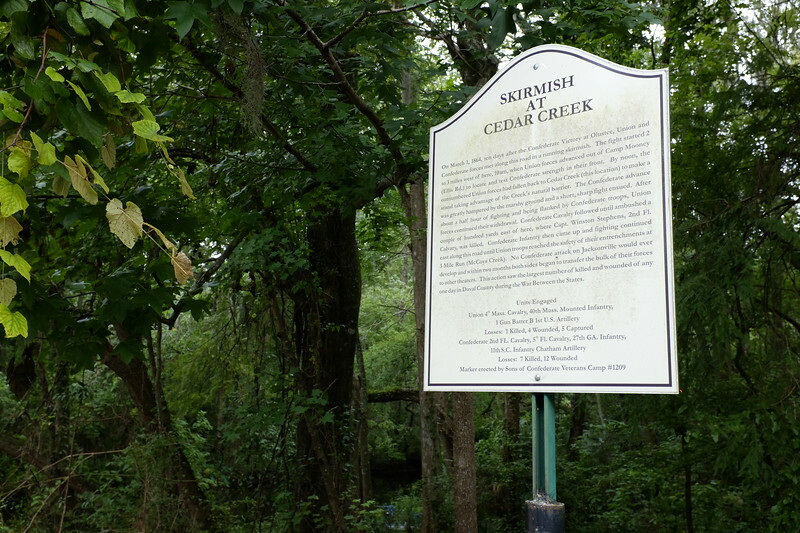 Location On March 1, 1864, ten days after the Battle of Olustee, Union soldiers from Jacksonville engaged a small Confederate force at Cedar Creek near present-day Lenox Avenue. The brief running skirmish led to the deadliest fighting Duval County saw during the Civil War, with one Union soldier and seven Confederates killed, and 16 wounded. 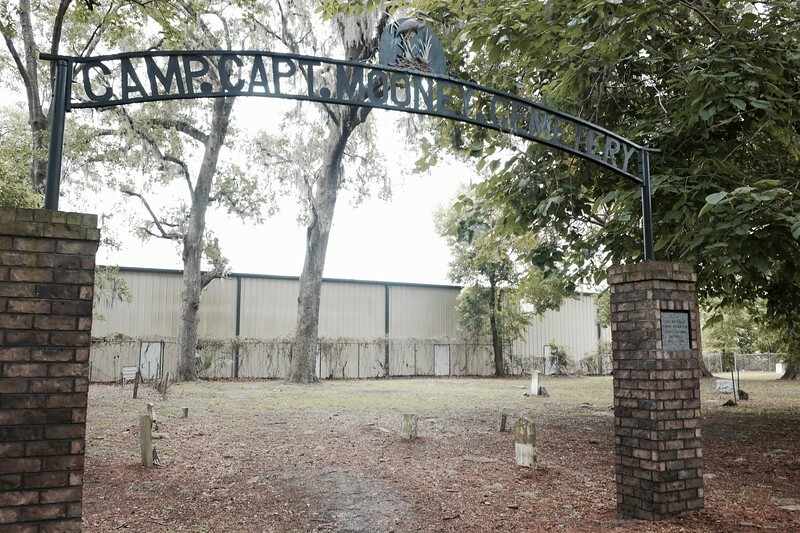 According to local tradition, some of the Confederate dead are buried in the nearby Camp Captain Mooney Cemetery. The Sons of Confederate Veterans placed a bronze marker detailing the skirmish in 2005; this was unfortunately stolen in 2010, and subsequently replaced with a PVC version. 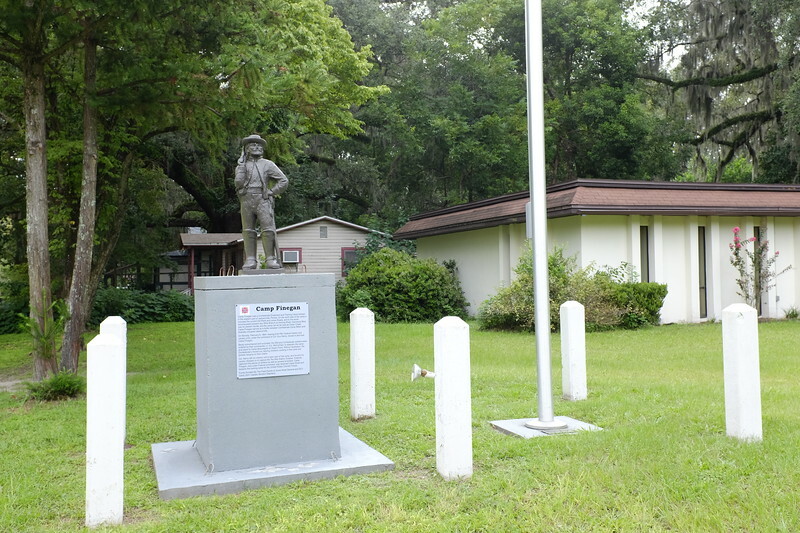 Location Named for General Joseph Finegan, Camp Finegan was a major Confederate fortification located near present-day Lenox Avenue eight miles west of downtown Jacksonville. It was established in 1862 during the first Union occupation and served as the Confederates’ main base in Northeast Florida. In February 1864, Union forces captured Camp Finegan during their fourth and final occupation of Jacksonville, and renamed it Camp Shaw. After the war, it was gradually absorbed by urban sprawl and its location was lost for nearly a century; its exact parameters are still not known with certainty. Some Marietta residents believe the encampment extended as far northwest as their neighborhood. In 2015, interested locals erected a small monument, featuring a Confederate soldier and a plaque, on the grounds of the Thomas Jefferson Civil Club. There have also been attempts to preserve an undeveloped tract that Marietta locals believe may preserve part of Camp Finegan.